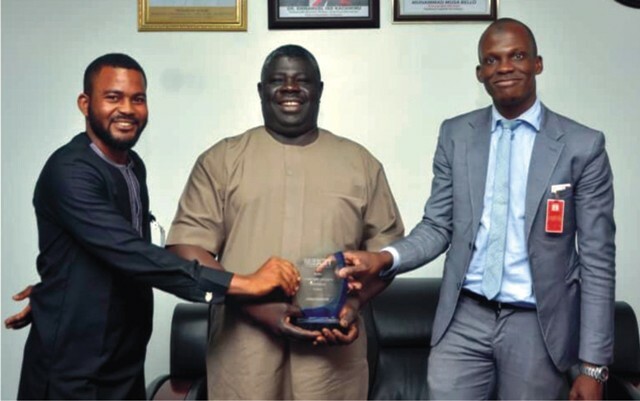 Chief Executive Officer, Texem UK, Dr Alim Abubakre (right) and a member of Texem UK, Mr Ahmed Abdullah (left), presenting award of honour to the Director of Petroleum Resources, Mr Mordecei Ladan in Lagos, last Thursday. The Minister of State for Petroleum Resources, Dr Ibe Kachikwu, has urged ExxonMobil and other International Oil Companies operating in Nigeria, to key into the gas commercialization policy of government for gas development in the country. Kachikwu gave the advise while fielding question from newsmen after visiting the ExxonMobil Erha Floating Production Storage and Offloadingvessels (FPSO) facility in Lagos, yesterday.